One of the first questions you must ask yourself whenever you come across an ancient settlement is what was their source of water. Nowadays, we can build towns and cities anywhere we like, more or less, due to our ability to pump water long distances. But in antiquity, this was not a possibility. So when choosing a location for a town, water availability was of primary concern. In Israel, there were four main sources of water for settlements. Fresh surface water (Lake Kineret/Sea of Galilee for example), springs, wells and rain collection. Lakes are obvious in meaning, but let me discuss the differences between the final three. Springs and wells tap into the same source of water, but at different points. After a rain, water seeps into the ground. It continues to pass through soil and porous rock until it reaches a layer that is impenetrable. This layer is known as an aquiclude. Water begins to gather above it, forming an aquifer, or underground body of water. The water spreads to the sides, and wherever it finds an opening (in the side of a mountain, for example) it spills out. This is a spring. 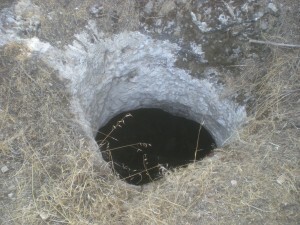 If however, man digs a hole from the surface, down to the aquifer, allowing him to lower a bucket and draw the water up to the surface, this is a well. But what would you do if you lived in an area that is not near a spring or convenient aquifer for making a well? Well then you might turn to rainwater collection. This can be a decent source of water, except for the fact that in Israel’s Mediterranean climate, it only rains in the winter, leaving us with at least a half a year with no rainfall. So you would need to store water not just for immediate or short-term usage, but for months at a time. Thus you need larger stores of rainwater. A cistern is a large hole dug in the ground (usually in bedrock) that is designed to store rainwater. It differs from a well significantly in that it only holds captured rainwater, as opposed to tapping into an underground water source, as do wells. What might be the problem with digging a hole to capture rainwater? Well, as I said earlier, rainwater seeps into the ground until it reaches a non-permeable layer of rock. So wouldn’t rainwater seep through the walls of a cistern dug in a porous layer? Yes it would, if a cistern was just a hole in the ground. But one of the most significant inventions in antiquity was lime plaster. By plastering the sides and bottom of a cistern, ancient man was able to prevent the seepage of water. This allowed for the creation of cisterns, and thus the long-term collection of rainwater. In turn, this permitted the spread of civilization farther from the natural water sources. So when you find a hole and are trying to determine if it was used as a cistern or not, one of the telltale signs is if you can still find plaster on the walls. Some of the plaster has survived to this day. Sometimes a rock would be placed over the opening, with smaller holes to allow water to enter, but keep out small animals and the like. Also there might be a larger hole for water drawing. Rope marks are often worn into the sides of openings from countless buckets being lowered into the cisterns to draw water. Some larger cisterns might have stairs running down and around the side to make it easier to draw water when the water level is lower. In Maresha, we find man made caves that were used as cisterns that might be 50 feet deep, and 25 feet wide. With cisterns of this size, we also find numerous channels carved into the surrounding rock so that water could flow in from various places, all gathering in one large pool. Didn’t Darth Vader say that to Luke Skywalker in “Return of the Jedi”? He was reading Luke’s mind and found that Luke knew about Leia. “Cistern…,” he said sneeringly. With your information that a well taps into water that is in saturated levels of soil, I think I should invest in one. I have heard that the land in the county I live in has a lot of water. Knowing this, I could save a lot of money on water bills if we had a water well dug on our property. Cool! I never knew that a person that lives in a country can consider digging a deep hole lined with lime plaster in order to use rainwater as its water supply. When you said that, it reminded me of my uncle, who is planning to create a hiking cabin this year. If he gets it built, I will ask him to find a contractor that can build this in his yard, so that he can keep himself hydrated while staying there.